We supplement our own web design and construction skills when needed. You tell us which template design is custom; which one is a purchased template package. You'll see websites that utilize pre-built Dreamweaver templates. You'll see large dynamic database driven ecommerce websites. Websites with PHP and ColdFusion topical expert support. 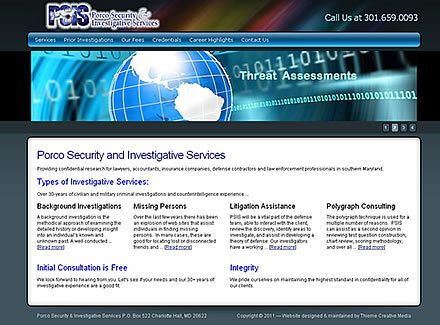 designing, building and launching the first ever website for a new southern Maryland private investigative services firm. determining which Web Hosting Company [WHC] would be best for one or our long-standing website clients, Association Vision.